Northern Ireland and the Republic of Ireland will have to retain "very close" if not full alignment on customs and market regulations after Brexit, Ireland's prime minister has said, contradicting Brexit supporters who have promised the UK will be free to set its own rules. 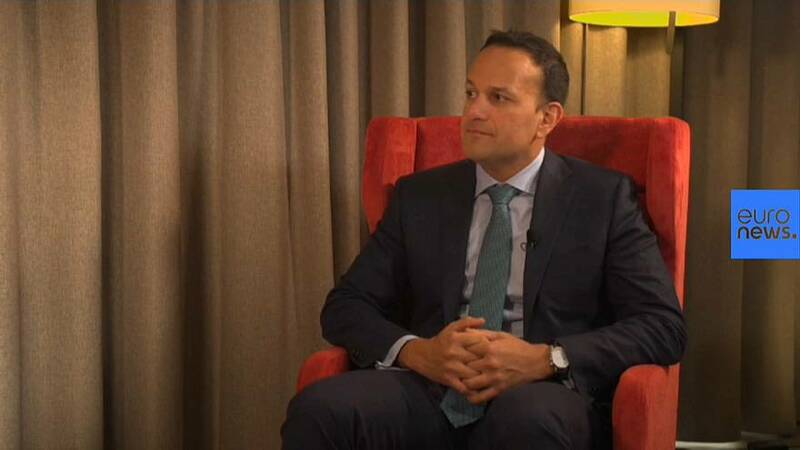 "As has been the case with Brexit from day one, I'm not sure it's been fully thought through," Leo Varadkar told Euronews' Shona Murray. "The only way in my view that you can avoid a hard border, in the longer term, is to have very close if not full alignment on customs and on market regulations. And that is a direct conflict with the view that the United Kingdom can go it alone entirely on these issues." Varadkar even suggested that the UK and Ireland would need to agree to retain common rules in the event of a No Deal Brexit in order to abide by the provisions of the Good Friday peace agreement. Asked whether in that case, Dublin might be forced to put up border infrastructure in order to prevent unauthorised goods entering the European Union from the north, Varadkar said he understood his country's responsibility to protect the single market but said details on how this would happen have not been discussed. Upholding the 1998 Good Friday agreement, which brought to a close decades of violence over the status of Northern Ireland, would trump economic concerns, he said, suggesting talks involving the EU with an aim to ensuring the border did not reappear would have to take place. The Irish border has been a decisive issue in Brexit talks, with members of Theresa May's government refusing to support the so-called backstop agreement which would commit the UK to following many EU rules for an undefined period in the event an alternative arrangement to avoid the need for border checks could be found. That would deny the UK a free hand in negotiating trade agreements with other countries. A previous suggestion that Northern Ireland could remain tied to Europe while mainland Britain pursued its own policies was dropped after criticism that it would in effect break up the United Kingdom.